United Kingdom: King George V orders the British royal family to dispense with German titles and surnames. Saxe-Coburg becomes Windsor and Battenberg becomes Mountbatten. 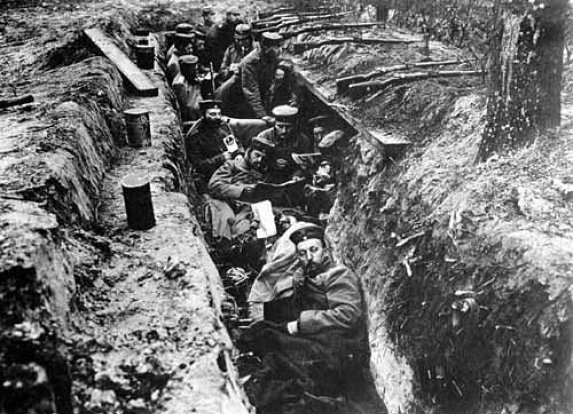 Despite devastating losses on the Eastern Front in 1916, the provisional Russian government—which succeeded to power after the abdication of Czar Nicholas II in March—had rejected all calls for peace. Alexander Kerensky, appointed minister of war in the spring of 1917, was determined to reinvigorate the Russian war effort, installing the victorious General Alexei Brusilov as commander in chief of the Russian forces and making plans to go back on the offensive within months. The disintegration and despair within the army continued, however, as some 30,000 deserters were reported from the front every day. At Kerensky's command, Brusilov launched another major offensive on July 1, the same day a massive peace demonstration was held in Petrograd. Though the new offensive resulted in heavy losses for the Russians, it was at home where the provisional government received its greatest threat. On July 15, 1917, an uprising in Petrograd encouraged by Leon Trotsky, an official of the Bolshevik Party, the radical socialist movement led by Vladimir Lenin—recently returned from exile due to German help—succeeded in briefly toppling the provisional government. The Bolsheviks saw their opportunity and attempted to seize power in Petrograd, as fighting broke out in the streets. The violence peaked on July 17. The following day, officers loyal to the provisional government destroyed the offices of the Bolshevik newspaper, Pravda. Lenin, sensing the time was not yet ripe for revolution, went into hiding, albeit temporarily, and Kerensky took charge, restoring order and continuing his efforts to salvage the Russian war effort. Adolf Hitler: The recommendation for his Iron Cross First Class is signed on this day by Lieutenant-Colonel Michael Freiherr von Godin. The Marne: Allied aircraft and artillery destroy all German controlled bridges, disrupt supply, and force the German attack to halt. 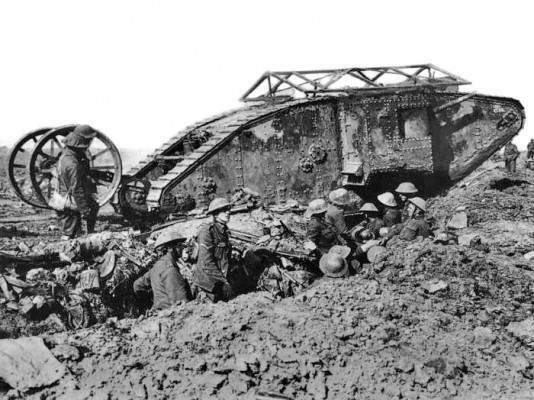 In the space of 5 months the Germans have suffered half a million casualties. Allied losses are somewhat greater, but American troops are now arriving at a rate of 300,000 a month. List Regiment (July 17-27): Gefreiter Adolf Hitler's 16th RIR, participating in offensive operations on the Marne and in Champagne, holds a bridge to the south of Courthiezy. That morning the Americans opposite succeeded in punching through a guard division creating a two-company-wide breach . . . . We still had a few minutes in which to tell our squad and group leaders about the situation and instruct them. I called two sergeant majors, five sergeants and a corporal together for this purpose. Just as I was beginning to give the necessary clarification, the unexpected happened! A light-artillery shot landed plumb in our midst. The effect of this direct hit was rather horrific! Three dead and six wounded, myself among the latter. Right shinbone cracked, large shell splinter in the right knee, the left side peppered with tiny splinters . . .Happily, I soon lost consciousness . . . . I'd been left for dead and left to lie where I fell. My situation was hopeless, anyway, and even the smallest, movement impossible. Increasing fire led me to imagine further American penetration . . .the barrage wandering, always closer, closer, always thicker, explosion after explosion, until finally a shell comes and rips me apart, before the hand of a doctor, be it German or from the enemy, could slake my agony. In connection with the Anglo-French landing on the Murmansk coast and the overt participation by French officers in the counter-revolutionary mutiny of the Czechoslovak mercenaries, I hereby give the strictest instructions to all institutions of the War Department, and to all service personnel generally, to provide no assistance of any kind to French or British military or navy officers, not to permit them to move from one town to another, and vigilantly to observe all their actions, since these are the actions of persons who, as facts show, are capable of plotting on the territory of the Russian Republic against the sovereign rights of the Russian people. This order is to be sent out by telegraph, and to remain in force until the reasons for it have been eliminated, which will be announced in due course. When Hitler came to power in 1933 outrages against the German Jews began immediately. This provoked a storm of protest all over the world. But, especially, it provoked ordinary Jews to organize to boycott German goods and services and sink the German economy. Many gentiles (non-Jews) joined them. This brought the Third Reich to its knees and within an inch of destruction. Hitler barely survived. What saved him? The established Jewish leaders did. To those who do not know Jewish history (almost everybody) this is amazing, inconceivable. In fact, it was normal. [The year] 1923 saw the establishment of General Primo de Rivera dictator of Spain with Alfonzo XIII as King: a monarchist government. By 1930, opposition to Rivera's right-wing government was a growing, and this ultimately led to his resignation and flight from Spain. In 1931 the monarchist government was rejected in the popular elections (las elecciones populares), which forced the abdication of Alfonzo XIII. Spain, now a republic for the second time (la Segunda Republica), began to suffer a good deal of political unrest as various political factions within Spain argued about the extent and speed of political reform. Left-wing parties formed a coalition (which dominated the Spanish parliament) to call for significant social reform while. At the other end of the political continuum, conservative groups threatened this loose coalition and over the years leading up to 1936 political views in Spain became progressively polarised. By the time the 1936 elections came around, the leftist Popular Front Party (el Frente Popular) had successfully unified various leftist factions to win at the polls. However, on July 18th 1936, an army rebellion started and thus the Spanish Civil War began. 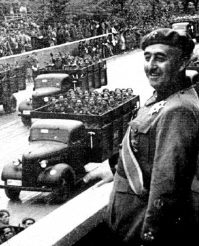 The conservative army generals led by General Francisco Franco, began a military coup to depose the elected government. 1938 Aviation: Douglas 'Wrong Way' Corrigan, the last of the early glory-seeking fliers, takes off from Floyd Bennett field in Brooklyn, New York, on a flight that will finally win him a place in aviation history. Eleven years earlier, American Charles A. Lindbergh had become an international celebrity with his solo nonstop flight across the Atlantic. Corrigan was among the mechanics who had worked on Lindbergh's Spirit of St. Louis aircraft, but that mere footnote in the history of flight was not enough for the Texas-born aviator. In 1938, he bought a 1929 Curtiss Robin aircraft off a trash heap, rebuilt it, and modified it for long-distance flight. In July 1938, Corrigan piloted the single-engine plane nonstop from California to New York. Although the transcontinental flight was far from unprecedented, Corrigan received national attention simply because the press was amazed that his rattletrap aircraft had survived the journey. Almost immediately after arriving in New York, he filed plans for a transatlantic flight, but aviation authorities deemed it a suicide flight, and he was promptly denied. Instead, they would allow Corrigan to fly back to the West Coast, and on 17 July he took off from Floyd Bennett field, ostentatiously pointed west. However, a few minutes later, he made a 180-degree turn and vanished into a cloudbank to the puzzlement of a few onlookers. Twenty-eight hours later, Corrigan landed his plane in Dublin, Ireland, stepped out of his plane, and exclaimed, "Just got in from New York. Where am I?" He claimed that he lost his direction in the clouds and that his compass had malfunctioned. The authorities didn't buy the story and suspended his license, but Corrigan stuck to it to the amusement of the public on both sides of the Atlantic. By the time "Wrong Way" Corrigan and his crated plane returned to New York by ship, his license suspension had been lifted, he was a national celebrity, and a mob of autograph seekers met him on the gangway. The Fuehrer once spoke to me in this connection and explained to me that in the leadership of a large movement and of a State three points of view had to be considered. First, there were men who, because of their nature, being impelled to, and best qualified for, studious examination of problems as they arose, would have to expound them in lectures and suggest solutions. Secondly, the leadership - or he himself - would have to select those which contained possibilities of realization; and thirdly, there were those people who had the task of taking the selected ideas and, by dint of painstaking labour, giving practical expression to them in the economic, sociological and political spheres. He conceived my task as coming under the first heading and entrusted to me the supervision of education, with the idea that I should adopt a constructive attitude, taking into account my knowledge of the movement. Barbarossa: Units of Heeresgruppe Mitte (von Bock) cross the Dnepr river near Mogilev, while in the South the Rumanian 4th Armee (Dumitrescu) captures Kishinev on the lower Dnestr." Malta: Axis bombers carry out raids on port facilities. 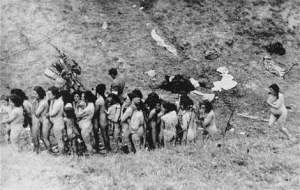 The reports of the Einsatzgruppen which report in detail their murder and robbery are the best evidence that we have of what the Einsatzgruppen did. When the U.S. Army captured the headquarters of the Gestapo they found hundreds of written reports from the Einsatzgruppen dispassionately listing their activities. There are two kinds of reports in the collection. "Activity and Situation Reports" (or "Situation Reports") were monthly compilations of the activities of all of the Einsatzgruppen. "Operational Situation Reports" (or "Operational Reports") were detailed reports from the various units giving, in precise detail, the number of murders committed . . . .
1942 World War II: Barbarossa: Units of Heeresgruppe A (List) capture Voroshilovgrad in the Donets industrial region. The German 6th Armee (Paulus) and 4th Panzerarmee (Hoth) continue their advance toward Kalach on the Don. Netherlands: The Germans deprive all Jews of their Dutch citizenship. 1943 World War II: Sicily: Units of the US Seventh Army capture Agrigento on the road to Palermo. Hitler tells his top generals at the Wolf's Lair that "barbaric measures" are needed to save Italy. 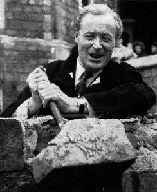 Only by terrifying the Italian population into blind obedience, he says, can they stiffen Italian resistance. The Soviets behaved in a hostile manner towards the Home Army units. After capturing an area they imprisoned the officers and men and transported them to camps deep in Russia. The Soviets decided to destroy AK and the civilian administration just because they represented the desire of the Polish people for independence. At the end of July 1944 the developments on the Eastern Front indicated an early entrance of Soviet troops into Warsaw. The Commander AK and Chief Delegate, in consultation with the Council of National Unity, determined that the capital city of Poland should be freed from the Germans by the action of Polish soldiers. The government-in-exile in London was advised about the readiness to start the battle. Between 23 June and early August 1944, multiple Soviet mobile groups employed deep operational maneuver across an 800-kilometer front to thrust deep into the German rear along numerous axes. The attacking Soviet forces forced the shaken German defenders to frantically erect new defenses along the Narev and Vistula Rivers, over three hundred kilometers west of their original defense lines. (i) Fighter Belt at Sea: Fighter aircraft will operate under close radio control at a distance of not less than 10,000 yards from the shore. (ii) Coastal Gun Belt: All anti-aircraft guns allotted for defense against the flying bomb will be deployed in a narrow strip 500 yards in width, extending along the coast . . . .
(iii) Inland Fighter Belt: Inland, between the coastal gun zone and the balloon barrage, there will be a second fighter belt in which aircraft will operate under running commentary control. The bursts of anti-aircraft fire in the gun belt should be a great help to pilots in spotting the line of flight of approaching bombs. By night they will have the additional assistance of searchlights over the whole of the inland fighter zone. (iv) Balloon Belt: There will be no important changes in the boundaries of the balloon barrage. The redeployment of the anti-aircraft guns on to their new sites along the coast was carried out over the week-end and the new defense plan came into operation at six o'clock this morning. The distinctive buzz emitted by the pilotless aircraft shortly before dropping on random targets at any time of day or night had injected a new element in the war of nerves. In his diary Butcher wrote that "most of the people I know are semi-dazed from loss of sleep and have the jitters, which they show when a door bangs or the sound of motors from motorcycles or aircraft are heard." Widewing and Telegraph Cottage attracted more than a fair share of alerts. On one night alone, Butcher counted twenty-five V-1 explosions between 7 PM and 1 AM. Routinely, Eisenhower, Summersby, Butcher, Gault, McKeogh and Hunt retired to the stark white-walled shelter to spend the night in sleeping bags or cots . . . . 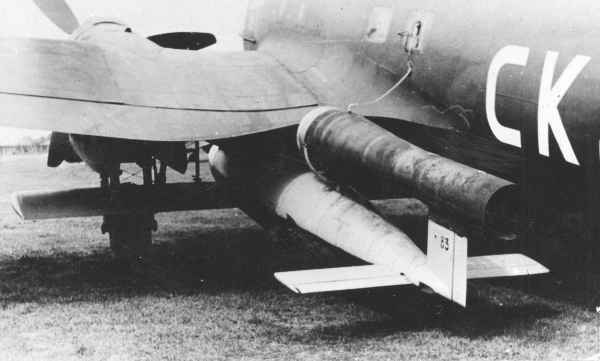 Fighters and anti-aircraft together would down 46 percent of all V-1s fired. Of the 10,500 V-1s launched at England, an estimated 25% flew off course because of malfunction. Roughly 20 percent penetrated British defenses and hit targets, claiming 10,000 lives and1.1 million homes, including parts of the Royal Lodge, Windsor Castle and the Hampton Court Palace. These figures, while grave, did not justify prolonged diversion of strategic bombers. SHAEF stood by its conclusion that the V-1 was neither an effective 'city destruction' weapon, nor very useful militarily . . . .
Crossbow peaked on the nights of July 4-5 and 7-8 in two intensive raids on launching sites and storage depots at Calais. On the fifth, 227 Lancasters dropped six "earthquake" bombs, but the sites escaped damage. V-1 attacks resumed, and Crossbow was quietly downgraded, with Churchill's tacit consent. At a press conference Eisenhower put the best light on this decision. He expressed sympathy for the plight of the British population. He conceded that the flying bombs, if equipped with infra-red type guidance systems, might have great military possibilities some day. For now, though, he said he did "not like them and everyone with whom I talk shares this feeling." The flying bomb was "a nuisance" and the military had resolved to "get on with its work and pay no attention to it." Meanwhile, the War Cabinet resolved to push the British flying bomb program. "What will be their application in our hands?" Air Chief Marshal Bottomley asked Tedder that week. "In their present form they are a toy," Tedder replied, "but their development will profoundly affect both war and peace." War at Sea: The largest convoy of the war embarks from Halifax, Nova Scotia under Royal Canadian Navy protection. Rommel: Returning by car to his HQ at La Roche-Guyon from a tour of inspection to Ist SS-Panzerkorps S of Caen, Field Marshal Erwin Rommel, C-in-C of Heeresgruppe B, is severely wounded in a low-level attack by an RAF fighter bomber. 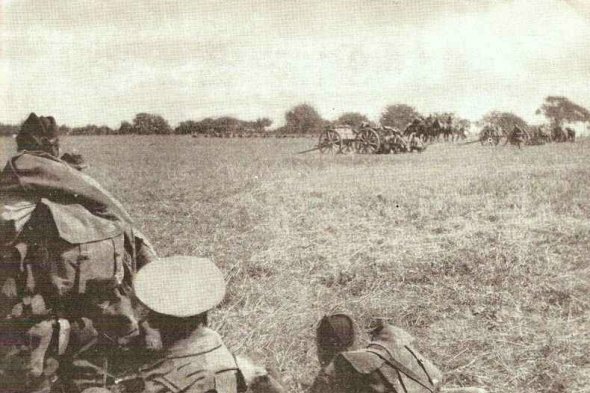 Italy: The British Eighth Army advances toward Ancona and Florence. Moscow: 57,000 German prisoners of war captured in Belorussia, including several generals, are paraded through the center of the city. Norway: the British Navy launches an abortive carrier raid on the German battleship Tirpitz in Kaa Fjord. The Port Chicago disaster was a deadly explosion that took place on July 17, 1944, at the Port Chicago Naval Magazine in Port Chicago, California, in the United States. Munitions being loaded aboard a cargo vessel bound for the Pacific Theater of Operations detonated, killing 320 sailors and civilians and injuring 390 others. Most of the dead and injured were enlisted African American sailors. A month later, continuing unsafe conditions inspired hundreds of servicemen to refuse to load munitions, an act known as the Port Chicago Mutiny. Fifty men, called the Port Chicago 50, were convicted of mutiny and sentenced to long prison terms. Forty-seven of the 50 were released in January 1946; the remaining three served additional months in prison. During and after the trial, questions were raised about the fairness and legality of the court-martial proceedings. Due to public pressure, the United States Navy reconvened the courts-martial board in 1945; the court affirmed the guilt of the convicted men. Widespread publicity surrounding the case turned it into a cause celebre among African Americans and liberal white Americans making it, along with other race-related Navy protests of 1944-1945, a significant motivator for the Navy to change its practices and begin in February 1946 to desegregate its forces. The final "Big Three" meeting between the United States, the Soviet Union, and Great Britain takes place towards the end of World War II. The decisions reached at the conference ostensibly settled many of the pressing issues between the three wartime allies, but the meeting was also marked by growing suspicion and tension between the United States and the Soviet Union. 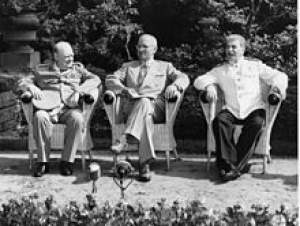 U.S. President Harry S. Truman, Soviet leader Joseph Stalin, and British Prime Minister Winston Churchill met in the Berlin suburb of Potsdam to discuss issues relating to postwar Europe and plans to deal with the ongoing conflict with Japan. By the time the meeting began, U.S. and British suspicions concerning Soviet intentions in Europe were intensifying. Russian armies occupied most of Eastern Europe, including nearly half of Germany, and Stalin showed no inclination to remove his control of the region. Truman, who had only been president since Franklin D. Roosevelt died three months earlier, arrived at the meeting determined to be "tough" with Stalin. 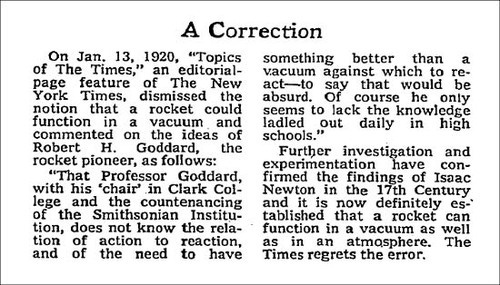 He was encouraged in this course of action by news that American scientists had just successfully tested the atomic bomb. The conference soon bogged down on the issue of postwar Germany. The Soviets wanted a united but disarmed Germany, with each of the Allied powers determining the destiny of the defeated power. Truman and his advisors, fearing the spread of Soviet influence over all Germany—and, by extension, all of western Europe—fought for and achieved an agreement whereby each Allied power (including France) would administer a zone of occupation in Germany. Russian influence, therefore, would be limited to its own eastern zone. The United States also limited the amount of reparations Russia could take from Germany. Discussion of the continuing Soviet occupation of Poland floundered. Death: Ernst Busch: German field marshal: Busch served under Wilhelm von List during the Polish September Campaign of 1939, and the following year he led the German Sixteenth Army during the Western Offensive. 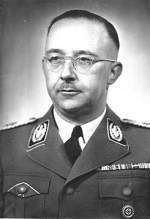 He was awarded the Knight's Cross by Hitler for his efforts. Busch took part in Operation Barbarossa and on 8th September 1941 his 16th Army took Demyansk before taking part in the siege of Leningrad. Despite a counter-attack by the Red Army, Busch's troops held the line from Staraya to Ostashkov. After a brave defence of his position he was promoted to Field Marshal. He commanded Army Group Centre in 1943-1944 but after a disastrous defeat in Belorussia, resulting from Hitler's strategic mistake, he was sacked by Hitler early in July 1944 and replaced by Field Marshal Walther Model. Busch was recalled in March 1945 when he became head of Army Group Northwest. Along with Kurt Student and his 1st Parachute Army, Busch had the task of trying to halt the advance of Field Marshal Bernard Montgomery and the Allies into Germany. Busch surrendered to Montgomery on 3rd May, 1945, and died in a prisoner of war camp in Aldershot, England. 1946 Death: General Dragoljub Mihailovi: Serbian general now primarily remembered as leader of the Yugoslav Royal Army in the Fatherland (the "Chetniks") during World War II. After the war, he was tried by rival Communist Partisans for alleged collaboration, shot and then buried in an unmarked grave. US President Truman posthumously awarded him the Legion of Merit for overseeing the rescue of five hundred American airmen by Chetniks during World War II. I have already shown that as a general principle Hitler did not permit Raeder, as Commander-in-Chief of the Navy, to intervene in questions concerning foreign policy, that is to say, in things which did not belong in his department. If Raeder did on occasion undertake this contrary to the will of Hitler in cases of special importance, then he could do so only privately, and was then unable to record these conversations in the War Diary. However, he always told everything to his Chief of Staff as his closest confidant. As a result Schulte-Monting could absolutely confirm that Raeder in this case opposed Hitler because of misgivings with regard to morality and international law, and furthermore also employed strategic reasons in the hope of thus being able to bring more influence to bear on Hitler. Schulte-Monting even stated-just like Raeder-that in November the latter had gained the impression, after a discussion, that he had dissuaded Hitler from his plans. I believe that this has clarified the matter, and only the tragic fact remains that Hitler paid just as little attention to Raeder's political objections with regard to Russia as with regard to Norway and France. Schirach is the youngest defendant here. He is also, of all the defendants, the one who was by far the youngest when joining the Party, which he did when he was not yet 18. Those facts in themselves are perhaps of some significance in judging his case. When still at school he came under the spell of rising National Socialism; he was particularly attracted by the Socialist idea, which had already in his country school recognized no difference between the sons of fathers of different classes and professions; those boys around Schirach saw in the popular movement of the twenties in Germany a promise of the resurgence of our fatherland from the aftermath of the lost Great War into a happy future; and fate willed it that as early as 1925, when he was seventeen, Schirach came into personal contact with Hitler in Weimar, Goethe's home. 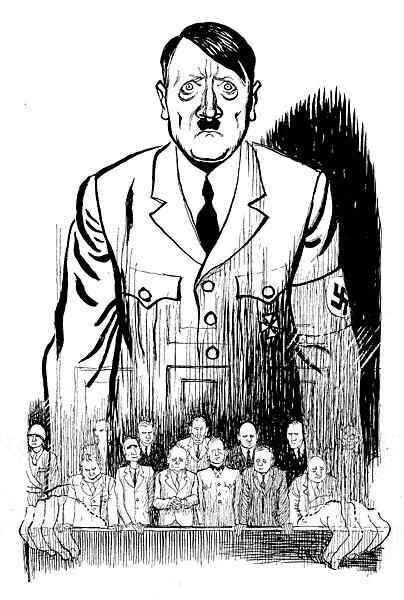 Hitler's personality made a fascinating impression on young Schirach, as he himself admitted; the program for the National Community (Volksgemeinschaft), which Hitler had evolved at that time, met with Schirach's wholehearted enthusiasm, because he thought he saw reproduced therein on a full-size scale that which he had personally experienced in a small way in the comradeship of the country school and in his youth organization. To him and his comrades Hitler appeared as the man who would open for the younger generation the road into the future; of him this younger generation had hopes for its prospects of work, its prospects of a secure existence, its prospects of a happy life. Thus the young man became a convinced National Socialist; this fact was the result of the environment in which he had spent his youth and which formed a soil only too fertile for the growth of that ideology which young Schirach embraced because at that period he held it to be the right one. This environment of his childhood and a vast amount of one-sided political literature, which the young man devoured in his thirst for knowledge, made of him, while still an inexperienced youth, also an anti-Semite. He certainly did not become an anti-Semite in the sense of those fanatics who ultimately did not shrink even from acts of violence and pogroms, of those who finally created an Auschwitz and murdered millions of Jews; but an anti-Semite in the moderate sense, who would merely curb Jewish influence in the government of the state and in cultural life but for the rest would leave untouched the freedom and rights of Jewish fellow citizens and who never thought of exterminating the Jewish people. At least that is the conception of Hitler's anti-Semitism which young Schirach evolved during those years. 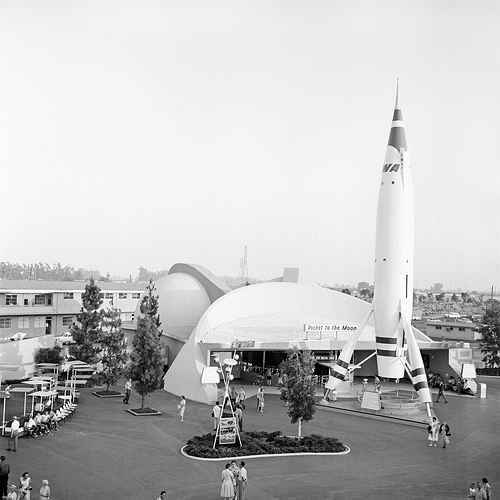 1955 Disneyland has its grand opening: Werner von Braun, Hitler's former chief rocket scientist, in collaboration with Ward Kimball, is the main creative contributor to one of its main features, Tomorrowland. Its centerpiece is a 76-feet tall V-2 shaped rocket on three shock-absorbing legs. The white rocket with red trim is named TWA after Trans World Airways, which has purchased the naming rights. Behind the building is the Rocket to the Moon attraction, which provides visitors with a simulated journey of a journey to and around the Moon, but no actual landing. There is still much uncertainty as to whether or not a landing on the Moon is even possible, with much speculation that its surface may be covered with a thick layer of "Moon Dust" that would swallow any lunar-lander whole.